JW Caldwell (b. 1974) received his BFA ('97) from Point Loma Nazarene University in San Diego. Caldwell's work draws influence from disparate sources; from Abstract Expressionism to western illustration, Pop Art to old hunting photos. 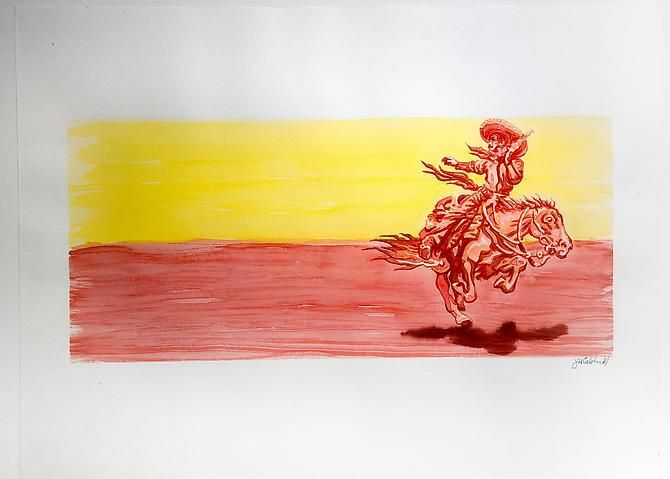 He has developed a loyal collector base and has been exhibiting his paintings of cowboys, shipwrecks, hunting and fishing trips, and wild animal permutations for over fifteen years. His recent exhibitions include Trifecta Gallery in Las Vegas, "Dismounting Your High Horse with Style and Grace" (2008), "Shut Up" (2011), and "Wild West with David Levinthal" at MCQ Fine Art Advisory (2011). The artist currently lives and works in Las Vegas, Nevada.